Update: Ethan successfully completed his research work, presented his work publicly (at the Sigma Xi symposium), and passed his thesis defense. Therefore on 17 May 2012 Biology Department voted unanimously to approve his receipt of the Honors distinction for his biology degree. In the spring of his sophomore year, Ethan Degner received several emails from his professors regarding a fellowship that they believed him to be qualified for. Little did he know that this was the start of a life-changing journey for him. With the help of Fellowships Coordinator Alisa Rosenthal, Ethan began to prepare an application for the Environmental Protection Agency’s Greater Research Opportunities fellowship. Ethan speaks highly of his help from the fellowships office, “Alisa was great. She set up a timeline and helped me shape my application into the strong contender that it was.” He submitted his application and waited impatiently for a response. Over the summer, the good news came! The fellowship would help him pay his way through his junior and senior year and would fund a project for him over the summer. Ethan began to sort through more than 100 potential research projects for his summer research. He chose three that most interested him and interviewed with the advisors for each of the projects. Ultimately, he was assigned to work in a lab called Gulf Breeze, located on an island in the middle of Pensacola Bay. 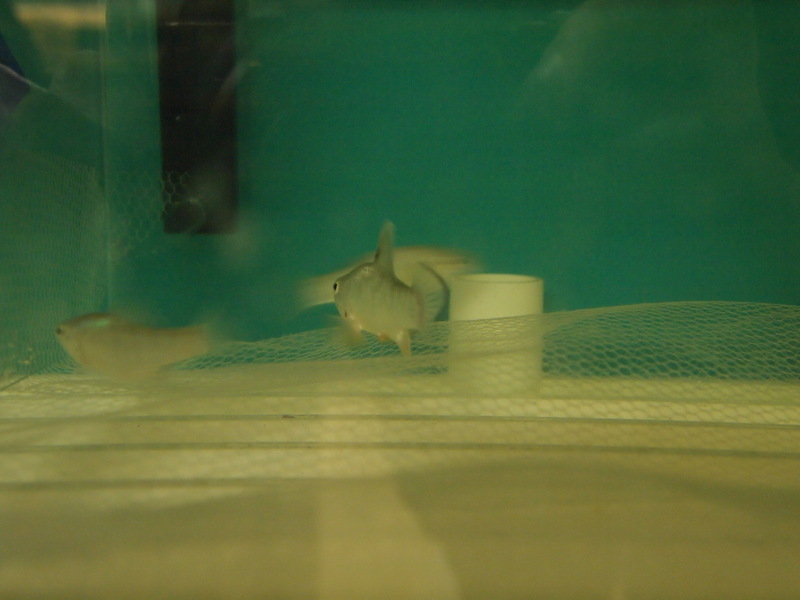 There he participated in pilot studies for upcoming research on the sheepshead minnow and chronic toxicity from sediment exposure using oil from the recent spill in the gulf. Ethan enjoyed his time spent researching at Gulf Breeze. He gained lab experience in a government-run lab, following more stringent protocols and taking careful note of all of his procedures. Working independently and collaborating with others, he was able to ask a lot of questions and generally felt well qualified for his position given his experiences at Gustavus. His experiences with sheepshead minnows did not end with the summer however. Inspired by his summer work, Ethan drafted a proposal for an Honors Thesis in the fall of his senior year. 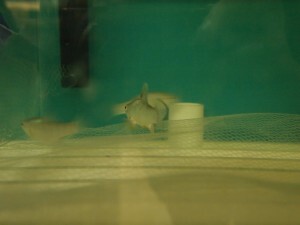 After searching background literature and asking his advisors for ideas, Ethan settled on studying hatch plasticity in the sheepshead minnow. He requested that several faculty members at Gustavus, Joel Carlin and Jon Grinnel, as well as his advisor from Florida, Sandy Raimondo, be the committee members for his thesis. His project is currently underway and many months have been spent preparing a test apparatus, spawning eggs and counting hatch rates. Ethan has continued to utilize knowledge gained over the summer rearing the minnows and recording his procedures. 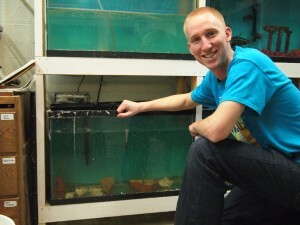 He hopes to publish his results in the spring, wrapping up a research journey that has brought him to the gulf and back. Ethan successfully completed his research work, presented his work publicly (at the Sigma Xi symposium), and passed his thesis defense. Therefore on 17 May 2012 Biology Department voted unanimously to approve his receipt of the Honors distinction for his biology degree.